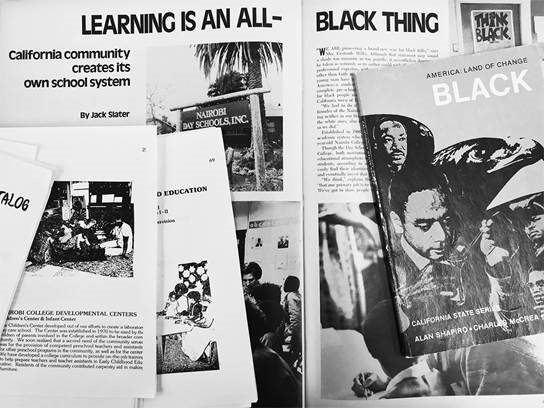 Kameelah Janan Rasheed shares materials from her personal archival collection of printed matter, including small press publications, magazine articles on independent black schools, textbooks and curriculum sets from the mid-1970s, course catalogues, independent black periodicals, and contemporary texts. During library hours, visitors are welcome to explore the archival materials and engage in informal discussions with the artist. Outside of these hours, visitors are encouraged to use reproductions of these materials. Library Hours are organized in conjunction with the “The Black School x Kameelah Janan Rasheed,” an exhibition and residency that explores the past and future of black critical pedagogies. Kameelah Janan Rasheed (b. 1985, East Palo Alto, CA), is a visual artist and writer based in New York. She explores language and narration through an interdisciplinary practice that includes installation, poetry, publications, performance-lectures, and learning environments. Rasheed is a former high school history teacher now working as a curriculum writer, teaching artist, and college instructor focused on research-based art practices.